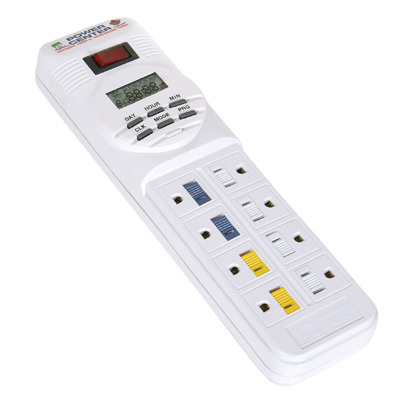 A power strip can significantly cut your electric usage and bill. It does this by eliminating or reducing what are known as “phantom loads”. A phantom load is the amount of energy your electronic devices draw while they are either idling or turned off completely. That’s right, sometimes, even when an electronic device is fully “powered down” it can still be drawing power. While this isn’t necessarily true of some modern electronics, it’s quite often the case with older models. In some cases, eliminating phantom loads could save you as much as 10% on your monthly electric bill! 1. Plug your timer strip into an open wall outlet. Timer strips need to be plugged into a wall in order to work, but have no fear, these little guys draw very little power and will do far more to reduce your power consumption than add to it. 2. Plug all the electronic devices you want to control with the timer strip into it. Timer strips work best for bundling electronics that are used together, such as TV’s and stereo systems or modems and routers. In many cases the timer strip will feature eight outlets, four of which will be turned on and off by the timer, while the other four will be powered consistently. 3. Figure out when you do and don’t need to supply power to these devices. The best way to make use of your timer strip is to have it eliminating power while you’re either out of the house or asleep. So if you’re a person who works a 9-5 job and is usually in bed by midnight your “off times” could be from 9am-5pm and 12am-7am. Conversely, your “on times” could be 7am-9am and 5pm-12am. We recommend that you consider powering up devices in the morning so that can use them before heading out for the day. 4. Follow your timer strips instructions on how to program your “on” and “off” intervals. There are a wide number of different designs for timer strips, but most often you’ll encounter ones with either a digital display or turn dial. Your timer strip should come with a set of instructions, be sure to follow them when installing. For now, check out this video on how to program a digital timer strip. By now your timer strip should be installed and function properly. If you notice that your timer strip isn’t turning on and off at the right times, consult the instruction manual that came with your timer strip. If you’re looking for more ways to save energy around the home, consider installing a smart strip or water efficient shower head. Both will help to reduce your monthly electric bill. And as always, read all about green home improvement: Green Living Ideas, after all, is a top 20 home improvement site! Photo courtesy of Pet Solutions.